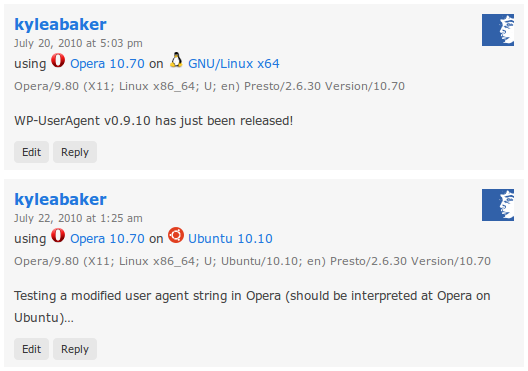 Identify Opera With Your Linux Distro! If you’ve ever noticed your user agent string before, then you may have noticed that Opera identifies as running on a generic Linux platform. This can be a bit bothersome or annoying if you’re a Linux enthusiast like me. Opera for Windows and Mac both properly identify the platform they are installed on, but Linux is a little more challenging due to the overwhelming number of distributions. You can easily adjust your user agent string to accurately reflect your platform and help promote both Opera and your Linux distribution when you browse and post online. Before and after Opera user agent string. Open “opera:config﻿#ISP|Id﻿﻿﻿﻿” in a new tab. Enter your distribution in the blank box in the format “Distribution/Version”. Click the Save button and restart your browser. This should successfully change your user agent from something generic like..
..to something a little more specific like..
Hope that helps! You can test your updated user agent strings in the comments below since they will appear above your comment. Or you can test it out at UserAgentString.com. How are you modifying the string at the end? I thought I saw a tutorial for this from you a while back, but I couldn’t find it anymore. What is the point of introducing another element into the user agent string? This seems like a bit of a security flaw when being so specific. In my opinion, introducing your platform type is no different than introducing your browser type. Tons of browsers are built around WebKit and Firefox, but they all tend to specify their own branding. Likewise, its a good idea in my opinion to let server administrators know not just which browser you are using to access their content, but the specific Linux distribution as well so that they can get an idea of the level of support that they should offer. If the platform specification were such a security risk, browsers wouldn’t announce specific Windows or Mac versions in the ua-string, and they ALL do this already. They considered this a security problem to be so specific so it was dropped. There has been an open bugzilla entry for some time about dropping specific versions of Windows too. When you have the browser AND OS version then you start to run into issues. But the point is that Opera is the *same* on every platform… they distribute the binaries and can give the same product everywhere. On Mozilla-based, Konqueror, etc you have a browser that is rebuilt and sometimes modified by the packagers so it makes sense to put the distro name in the package as something may differ. Although since it’s almost always the same rendering I still find it redundant, there is more reason than changing a string to represent a browser that is no difference. If you download a binary off of http://ftp.mozilla.org, it is still generic. I’m not sure if distros in the string are really that much of a security flaw, but when you know more and more information about a user’s system from the user agent, it makes it that much harder to exploit. hi can you tell me where can downloader you opera theme with orange buttons and opera menu black?? Previous Previous post: Ubuntu 10.10 Sound Indicator with Album Art! Next Next post: Ubuntu One Music Store..Get a Link!